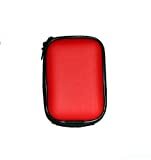 Dimension:70x110x40mm(internal),85x120x45mm(external),Red colour and waterproof material. Black, Blue,Pink and Silver colour are also available, please visit my shop for more details. Package includes: One case and one strap. This entry was posted in Discount Photography and tagged A300, Camera, Canon, Case, Coolpix, Cybershot, DMCSZ10, DMCSZ8, DSCW800, DSCW810, DSCW830, DSCWX220, DSCWX350, IXUS, Lumix, Nikon, Panasonic, S2900, S3600, S3700, S5300, S6700, S6800, S7000, Snug, Sony, Waterproof by Ball Photo. Bookmark the permalink.